December is the most popular time for agents to get stuck into online training as they gear up for the New Year. Educational courses online not only increase product knowledge but also can lead to preferred status for fams, client referrals, discounts and more. Quite simply, agents who are not enrolled are missing out. Find out why it's time to learn how to earn. Chris May, Managing Director of Equator Online Training and Travel Uni, says his platform sees two or three times the amount of people signing up in December compared to other months. 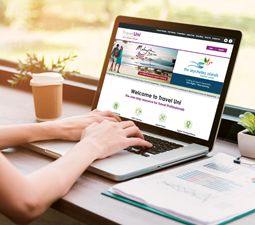 Tourist boards, hotels, rail companies, attractions and tour operators are represented across its online training platform, available free to agents. Las Vegas, New York, Malaysia, Thailand and Jumeirah are among Travel Uni’s most popular courses. A second provider, Online Travel Training (OTT), highlights themes like Adventure, Aviation and LGBT across courses including Mauritius, Mexico, Italy, Riviera and Collette. In common with its partners ABTA and TIPTO, Equator/Travel Uni believes training helps agents to demonstrate the value of their service to clients. “We want people to say ‘I’m going to see my travel professional’, not ‘my travel agent,’” says May. He adds: “There’s far too much ‘fake news’ out there; there’s an avalanche of information and even Trip Advisor is now taken with a pinch of salt. The average online course takes 90 mins to complete and is typically worked on in 20–30 minute sessions. Agents have different strategies for taking time out for training, some threading it between clients, over coffee breaks, commutes, etc, ‘bookmarking’ their place, others allocating set hours. And 22% of agents now complete Travel Uni courses on their mobiles. “Some high street agencies actually forbid training during work hours, while others will say “in gaps in time this is what we’d like you to achieve”, explains May. Agents report being more confident upselling once they’ve completed training. May says: “Those who know more about a destination sell a higher-value product with add-ons and upgrades. Some tourist boards and suppliers offer prize draws for flight tickets, holidays and Champagne, chocolate and vouchers, or let agents earn vouchers per booking once qualified. Others give them a place at the head of the queue for professional opportunities. “Naturally you get more support from a supplier or tourist board, you get invited to functions, on fam trips and get discounted rates,” says May. Sandals, Jumeirah, Thailand and Australia are among those who foster relationships with agents who have completed their training. Alaska, Jumeirah and others list qualified agents on their consumer sites, so they come up in a postcode search of the nearest experts. And those who change jobs within travel are more attractive to future employers if they have several training courses under their belt. Travel Counsellor Daryl Glean, who has completed several online courses on North America and Asia, won a Canada break thanks to a training course. “I was rewarded with a wonderful trip to Ontario for two, for seven nights, with flights, accommodation and tours… and on the back of my trip I secured a booking to Ontario worth over £7,000,” he says. He also appreciates getting discounted rail fares he’s able to pass onto clients since completing the Voyages-sncf course. Among new sign-ups, Travel Uni has recently added Cirque du Soliel – helping agents match the right show to the right client. US-based Simon Malls is also a new client. The company’s GDS training, the only training with a charge, has 25% off during December. Traditionally online courses involve reading modules then completing a quiz as an aid memoir. Now, there are webinars and more courses are featuring video content. For instance, St Lucia’s Windjammer Landing, which has over 5,000 training course users worldwide, features a staff member giving a video walk through rooms, the beach and more. The Cayman Islands and OTT recently offered a training session via Facebook Live. Equator/Travel Uni will be introducing podcasts in the first quarter of the new year, to help agents learn on the move. Interactive videos with questions built within them will also become more common. “I’ve completed over 30 courses. I find some easier than others but I always learn something. I feel it’s part of my role to always be developing my product knowledge, which I can then use to help clients. “It has helped me grow my client base and get referrals. When you’re a specialist people do recommend you. This has been especially true for cruise (I’m a CLIA master), the U.S., Canada and Australia. “There’s satisfaction in completing the course and receiving a certificate to share. Some offer the odd prize but that’s not really the incentive. Some, such as the Australia Aussie Specialist course, link training to the opportunity to go on fam trips, which I still think is the best, most comprehensive destination training. “I’ve been in the business nearly 40 years and the current training opportunities are the best they’ve ever been. So, I can always make time. I target each month to broaden my product knowledge. I believe you have to keep developing as our business and clients become more knowledgeable and demanding.